Quite simply the worst iPhone and iPad game we've played. Yes, that includes the ones that fart. There are bad video games, and then there's The Relic, an App so shockingly terrible it has no right to exist. At first glance, it appeared to be a spiritual successor to the classic arcade hit, Gauntlet, and we had good reason to think it was worth our time, since the highly regarded Chillingo published it. Oh dear reader, how wrong we were. To call this game a mess is an insult to the word. We knew something was fishy after firing up the App and seeing the drab and borderline unresponsive menus. The real kicker, though, is the cheesy Renaissance fair music. Suffice to say, we killed the audio. As for the game, well, it's god-awful. You play as some barbarian charged with raiding dungeons to slay hordes of monsters and collect loot, the standard objectives in hits like Gameloft's Dungeon Hunter series. 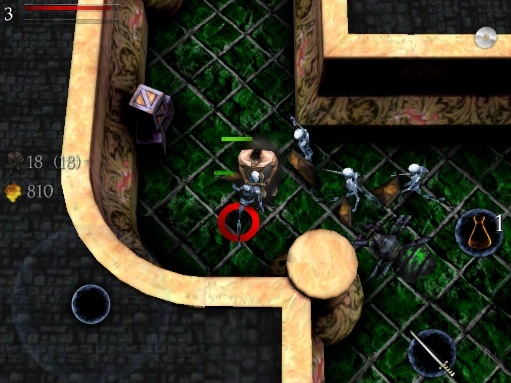 In this respect, The Relic delivers, as it features a ton of items to grab and scores of enemies that attack en masse. This, however, is one of the game's many problems. 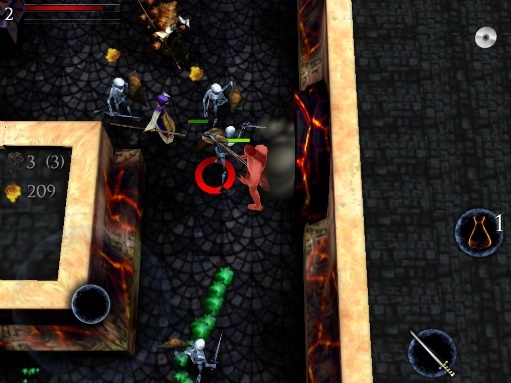 As soon as the creatures appear (a bunch of skeletons, oversized tarantulas and wizards), the App's performance goes into the toilet, struggling to keep up with the on screen mayhem. The hero, meanwhile, is near impossible to control, thanks to one of the worst virtual analog sticks we've used. Forget about the fact that your thumb needs to be directly on the dark circle for him to move. It doesn't work. You tilt in one direction and the warrior fails to budge. Even repeated swipes don't yield a response. Now imagine roughly ten monsters appearing from all directions, and you might as well ring the dinner bell. As for the combat, we could not believe how broken the swinging animations look, making it impossible to tell when we made contact. Instead, we mashed the button and hoped to survive. At this point, we shouldn't have to finish this review with "don't buy The Relic", but just in case you're the slightest bit interested, for the love of all things beautiful and Holy, don't purchase this disaster unless you enjoy watching train wrecks. It's the first App that makes us regret spending $0.99, and if Modojo had the option to award a game a zero, rest assured The Relic would have made history. For all we know, an update is on the way, but don't expect developer Axolotl to transform vinegar into wine. What's Not: Stuttering frame rate, terrible controls, sloppy animations, cheesy music, cheap enemies.